Rated as the best one day trek in New Zealand and listed by many in the top 10 day treks in the world! Three magnificent volcanoes lie just south of Lake Taupo, towering over the lake like ancient guardians. They are Mount Ruapehu, Mount Tongariro and Mount Ngaruhoe. The three mountains and their surrounding terrain form part of the world’s only Dual Listed World Heritage Area – the Tongariro National Park. The breath-taking scenery in this National Park provided the setting for much of the Lord of The Rings movies, and guided Lord of The Rings tours are available. The three volcanoes are a very scenic one hour drive from Acacia Cliffs Lodge and are a must-see during your stay with us. See their splendour from above in a helicopter or small plane, or challenge yourself to what has been described as “the best one day walk in the world” – The Tongariro Alpine Crossing. Each year, more than 100,000 people hike this stunning track, seeing other-worldly landscapes such as the Emerald Lakes, massive craters and ancient lava formations. Tongariro National Park is a hiking and mountain biking heaven, and the trails are as varied in length and challenge as they are beautiful. 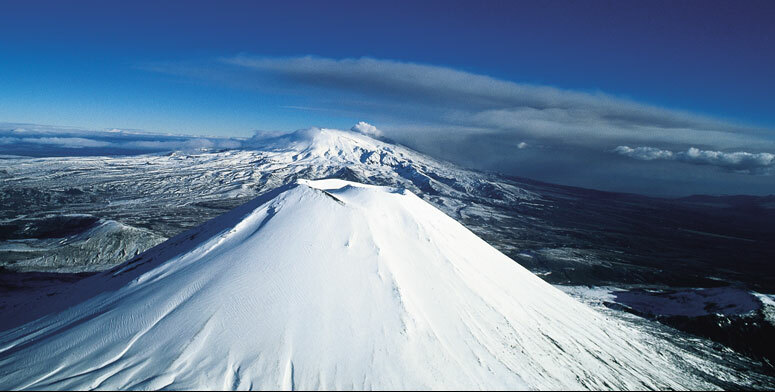 Mount Ruapehu is also New Zealand’s largest Ski Field. Click here for more information on skiing and snowboarding. This educational centre helps you discover the fascinating history and science of our three volcanoes, the giant crater that is Lake Taupo and the many features and mysteries of this volcanic region. There are interactive displays, multi-media exhibits, films and more to teach and entertain.